1. Happy Cinco de Mayo!! While I would love to be enjoying Taco Tuesday and sipping a margarita tonight, I will be teaching boot camp tonight. I created a workout that will burn the calories of ½ of a margarita and a serving of chips & salsa. Can you believe a margarita is 455 calories on average?!? No thank you. I will definitely be sticking to an ice tea from here on out. 2. The countdown has officially started for our next domestic trip to Miami, Florida! I am so excited to start researching everything we want to do while we are there. We will be traveling in September for 4 days. Besides spending as much time at the beach as possible, I’m really hoping we can visit the Everglades as well. Any tips on visiting Miami? 3. I am in love with my Fitbit Charge. 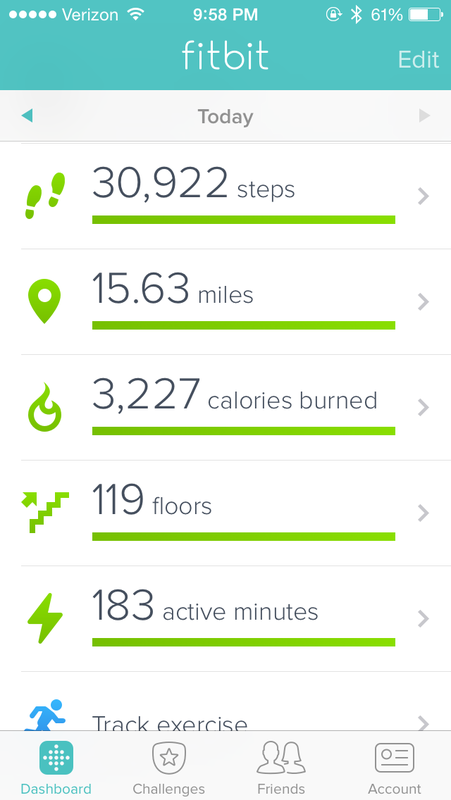 I am planning to write a full review of the Fitbit this week but until then I will keep talking it up. I find myself being much more active particularly at work. Having a desk job and back problems are a bad combo but having the Fitbit on my wrist is a great reminder to get up to take breaks more often. Tell me your random Tuesday thoughts in the comments. Hope you have a wonderful Cinco de Mayo! This entry was posted in Fitbit, Fitness, Travel, Tuesday and tagged Fitbit, Fitness, Travel, Tuesday. Bookmark the permalink.